Creating a DIY craft room is on the wish list for any home decorator or crafter…and let’s face it, if you are a budget decorator, they are often one in the same! So let’s get inspired to create a space where you can express yourself…and use your creativity to decorate your home. 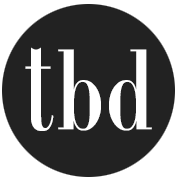 Whether you want to carve out an entire craft room, or just need some craft room organization ideas, this is the place to find it. 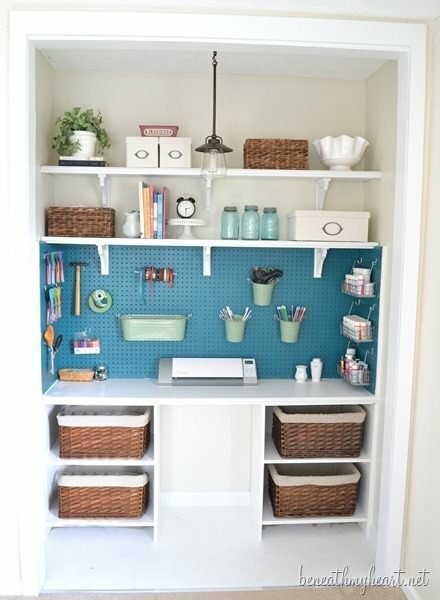 Oh, and don’t worry if your budget is tight or you need a craft room for a small space, we found ideas for that too! 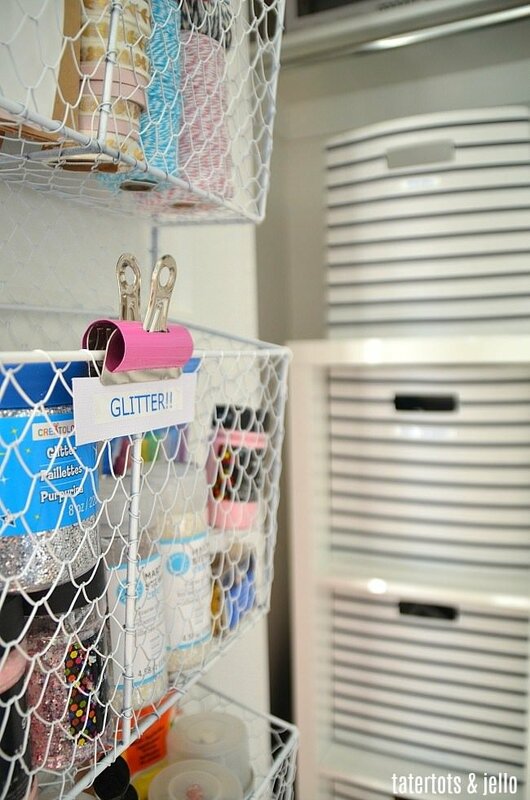 Here are some of the best DIY craft room ideas & projects we found, and tons of inspiration! We love the use of color in this corner guest room craft space. The shelving unit is adjustable to change it up when your needs change. Photo by ‘HGTV‘. It’s all about getting organized. Let’s face it, the problem with craft rooms is the chaos. 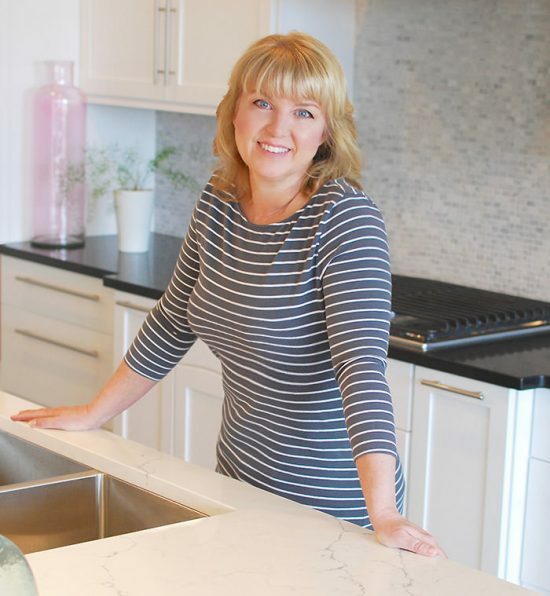 So make a list of the things you want to do within your space, and the materials you will need to do it. 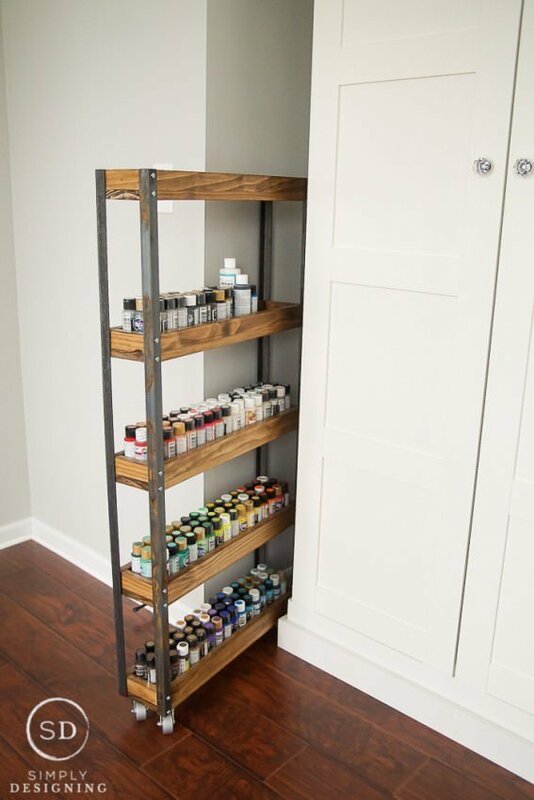 Do you need a space to store paints and brushes, or fabrics and thread? A large table for cutting and sewing? Or an empty corner for your easel? A little of it all? Make a list, and prioritize. Create an entire craft room for less than $250 with these easy plans from ‘Just Measuring Up‘. 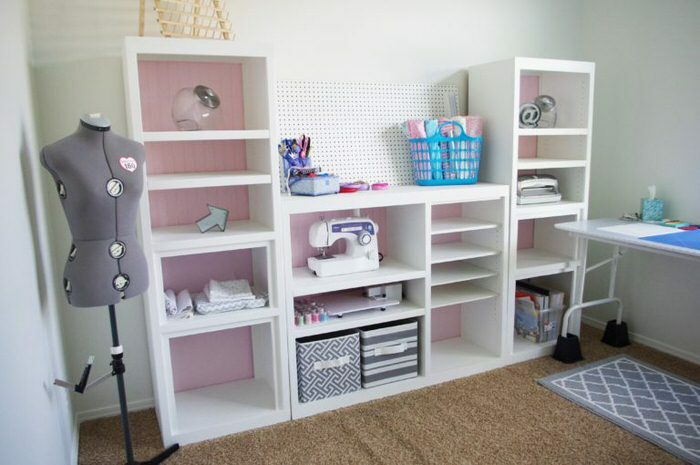 The tutorial includes plans for the pegboard storage, the cubby wall storage, and the shelving. Learn to turn frames into organizers with some pegboard, bright and happy colors, and this tutorial from ‘By Dawn Nicole‘! Keep like things together. If you are a general crafter, make sure your sewing supplies are near where you set up the machine, and your gift wrap is all with the ribbons and bows. Your paint supplies are all together in one place, so the next time you want to stencil a wall, all your choices are right there. 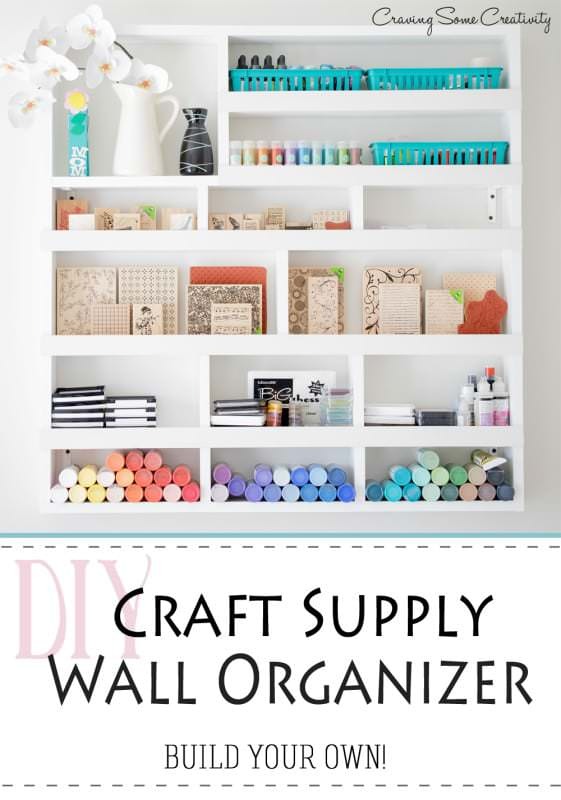 Build your own DIY craft supply wall with this tutorial from ‘Craving Some Creativity‘. 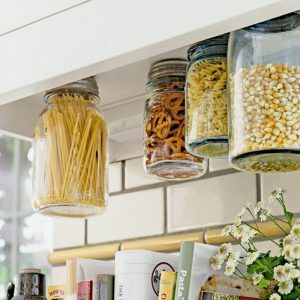 Look for budget minded storage solutions. You don’t have to invest in a huge storage system. Use thrift store furniture (repainted, of course!) sturdy boxes covered in pretty paper, and recycled items to create storage. 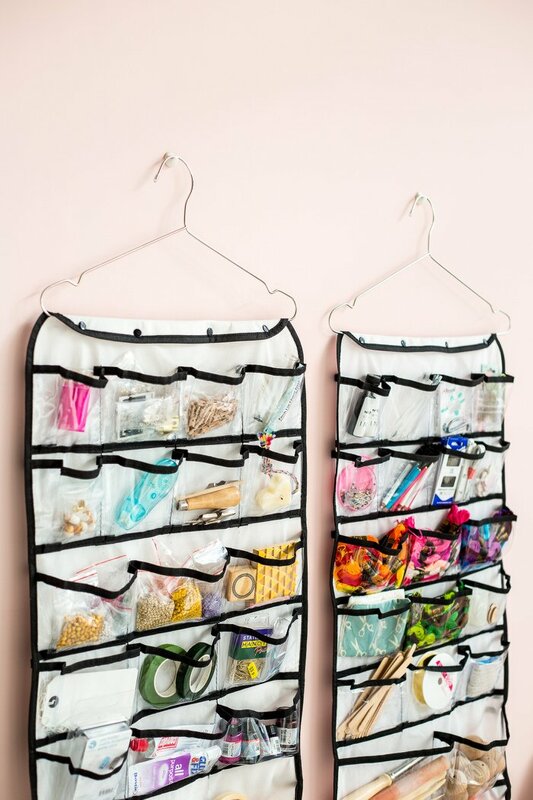 Try using clear hanging organizers like this idea from ‘Fall for DIY‘. Inexpensive and still looks good! Turn inexpensive shoe boxes into thrifty storage with this idea from ‘The Happy Housie‘. 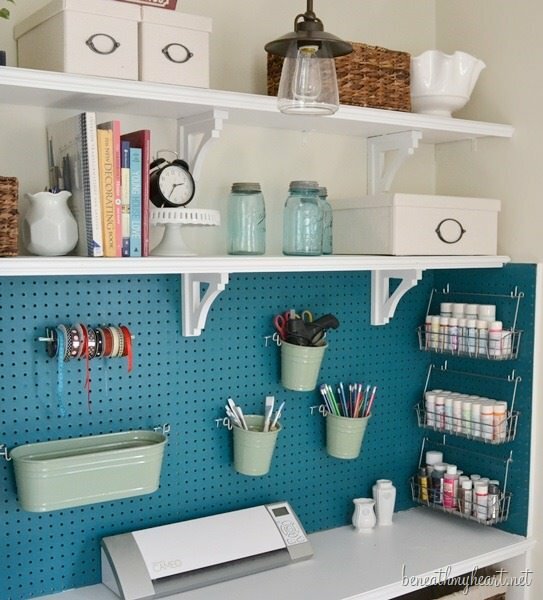 Just because your craft room is about function, doesn’t mean it can’t be pretty! 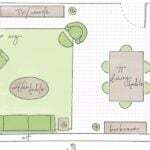 Make sure this space reflects your personality…after all, this isn’t like the living room where you have to plan the design for all the members of the family. This is your own personal, creative space. Let it show. 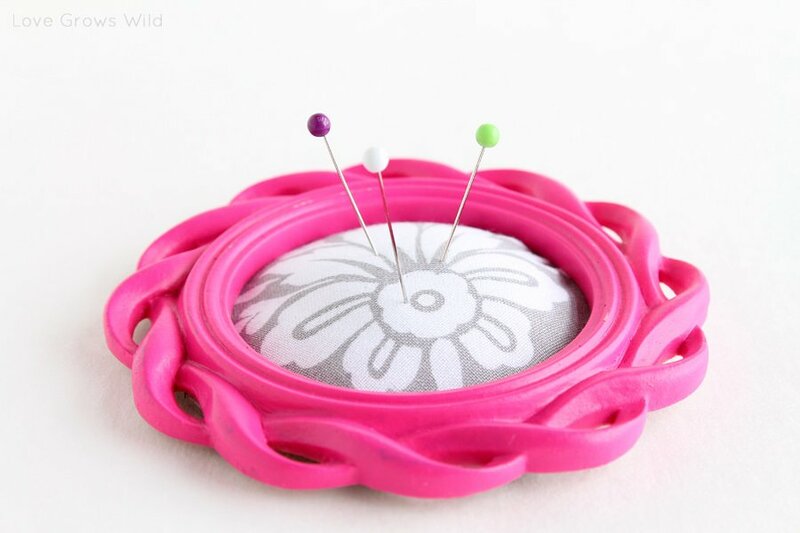 We love this little DIY pincushion from a dollar store frame from ‘Love Grows Wild‘. This DIY craft room wall was made out of a pretty sad looking throw away entertainment center from the ’80’s. 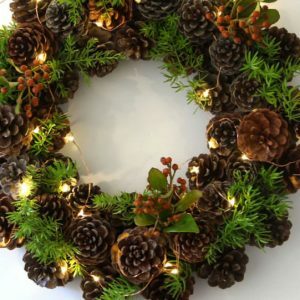 Easy project and lots of step by step photos. (You have to go check out the “before”!) From ‘Dreaming in DIY‘. So thats the basics of creating a craft room on a budget…Here are some more inspirational photos, ideas and tutorials for DIY craft room organization, storage and design ideas! 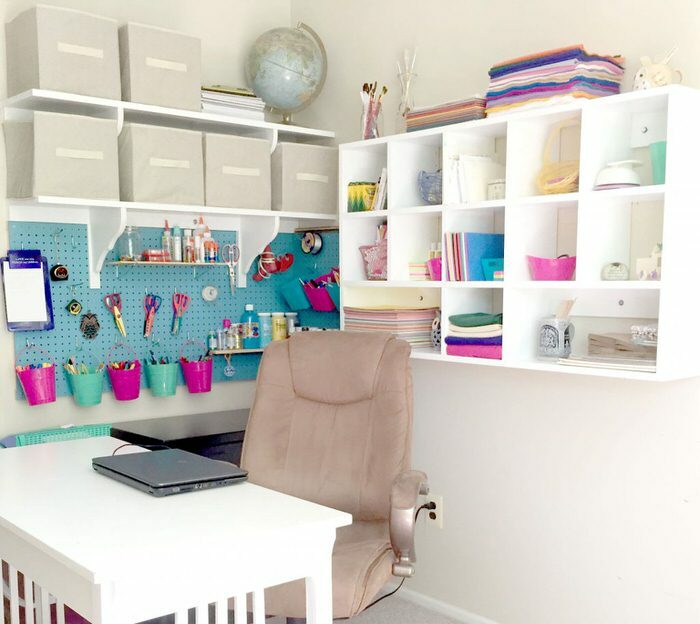 Ok, this one, I just love… wouldn’t you all love a craft room like this? The chandelier does it for me… Is there any space that couldn’t use a pretty chandelier? From Scrapbook.com. 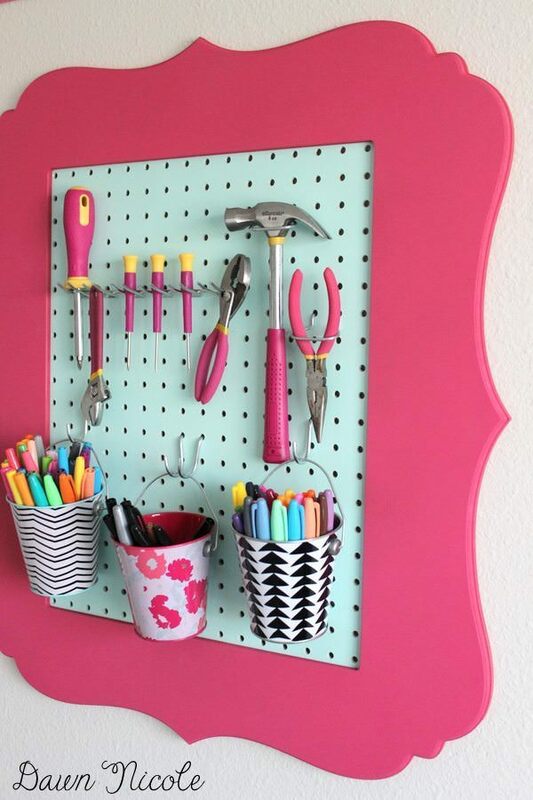 Check out this DIY pegboard craft storage wall from ‘The DIY Mommy‘. While you’re there also see her tutorial for her mason jar storage, that is the best part of the whole wall! 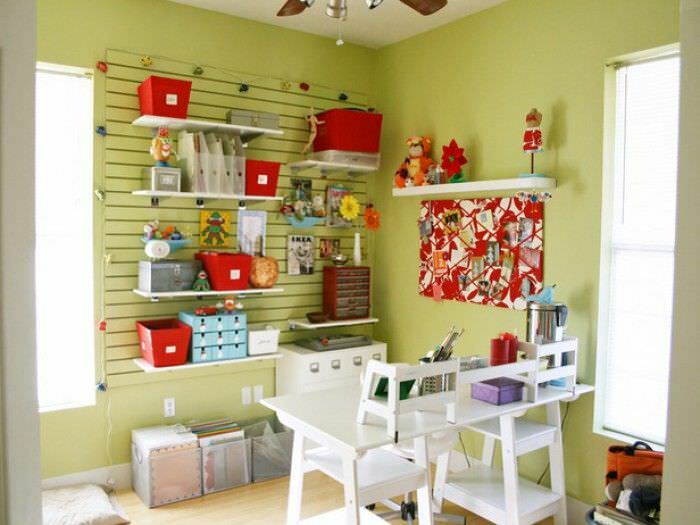 If you don’t have space for an entire craft room, perhaps a craft closet will do? Remember, organize, organize, organize! None of these containers is expensive, it’s simply a matter of having a spot for everything, and knowing where that spot is. (Hence, the labels!) Photo by ‘BHG‘. 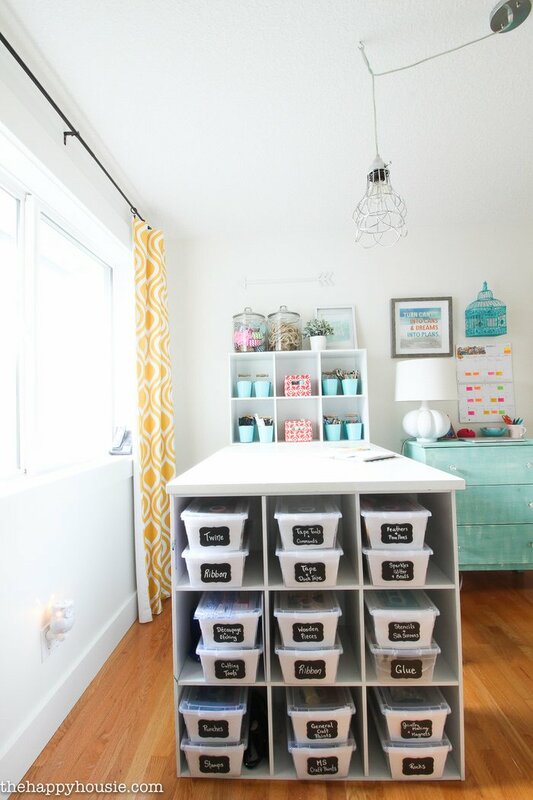 Need budget craft room storage ideas? Visit thrift stores for old spice racks! This idea comes from ‘Midnight Creations‘. Traci at ‘Beneath my Heart’ has a whole craft room tutorial on turning a closet into a crafting space. This is genius for those of us without an extra room. Getting the idea? 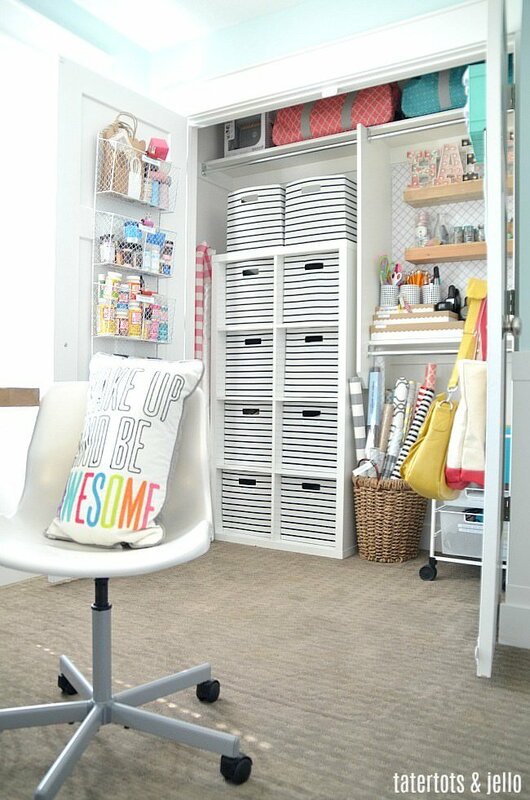 Use these tips and inspiration to create a DIY craft room just perfect for you! 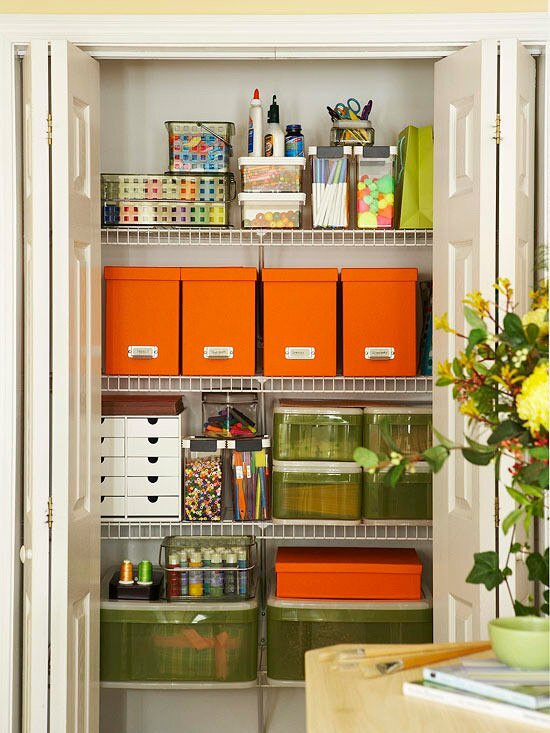 And when you are done with that, jump on over to our posts on 50 Ideas to Organize your Home, or Dollar Store DIY! I have always heard that, but why? Judy, laying markers on their sides (especially double-ended ones) keeps the ink from pooling at the end that’s down in the marker cup, say. It keeps the ink available at both ends of the marker and keeps the end that is “up” from drying out. Absolutely. Ink will run to both ends instead of just to one end and not the other. I found an idea about hanging ribbion spools on wooden hangers and now can not find it. HELP!!!!! I got a good idea to solve out some areas in my kitchen. Though still missing good space for all my handicrafts. 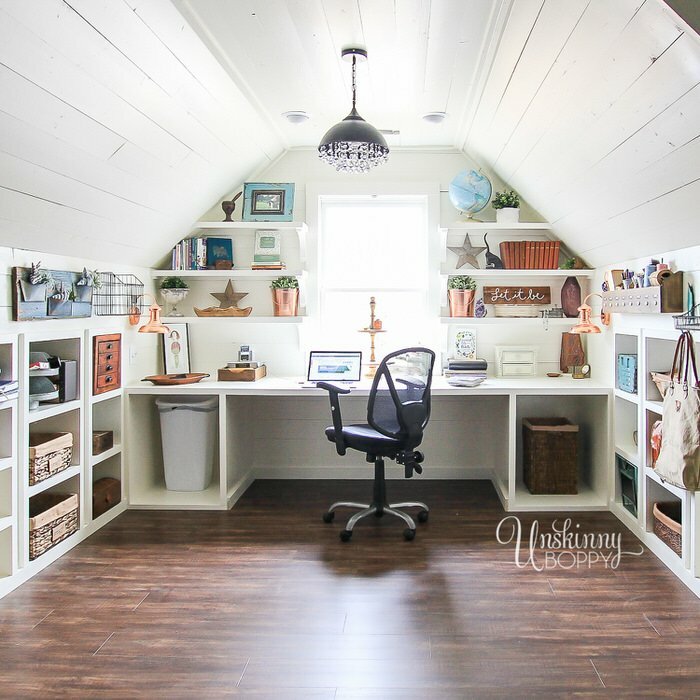 The top picture of a craft room has a slat wall. Do you know how the slat wall was made? I’m trying to figure out an easy way to make one and have it be strong. It’s a beautiful room! Try re-purposing a pallet…works great and inexpensive. 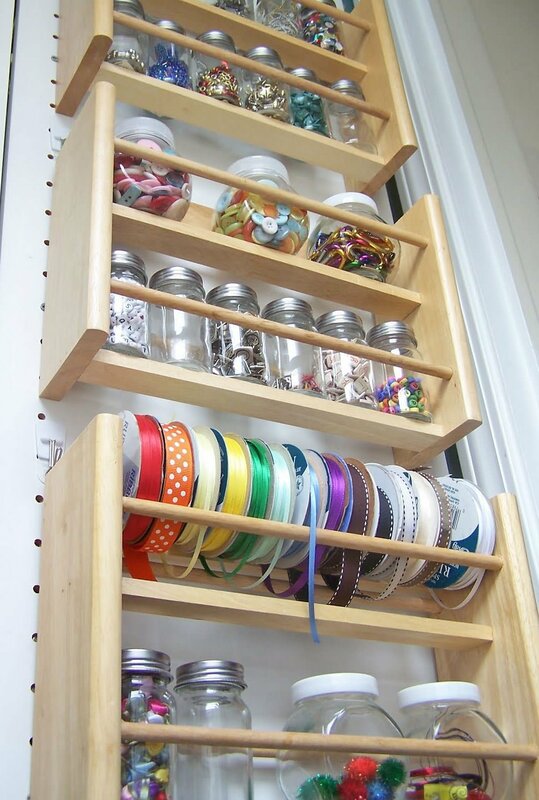 I tried the ribbon organizer on a dowel idea and after having to take it apart in order to take out empty spools…over and over…lol. I finally came up with what works for me. I keep my spools of ribbon in a drawer with dividers between rows of spools. I have a row for each color and ziplock bags for remnants. 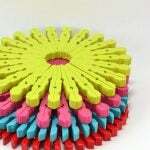 Now I can remove and add spools with ease! 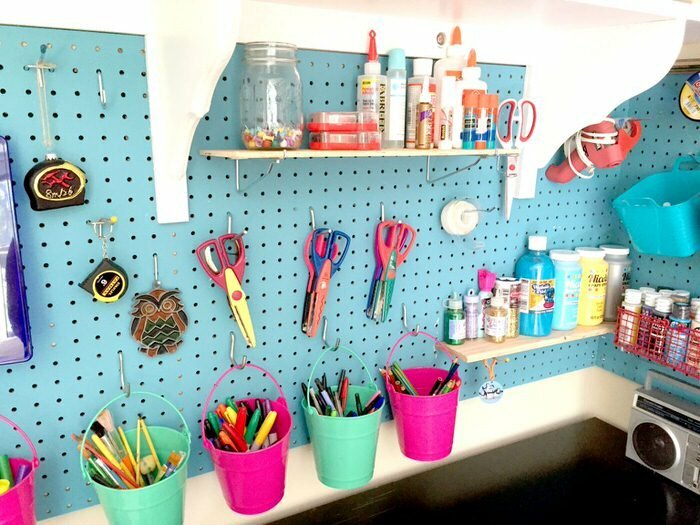 Some great tips for organizing a craft room. I definitely drooled a bit at that last room, too. Haha. Alas, we have a very small house so I could never dedicate a whole room to crafting. Perhaps one day if we restore the barn, there will be space for that, but right now that’s just not possible. I definitely love the idea of thrifting to find storage solutions, though! I have 2 Goodwills and a Habitat Restore really closeby. They are my favorite shopping haunts! Haha. Thanks for sharing! I love that blue craft room! 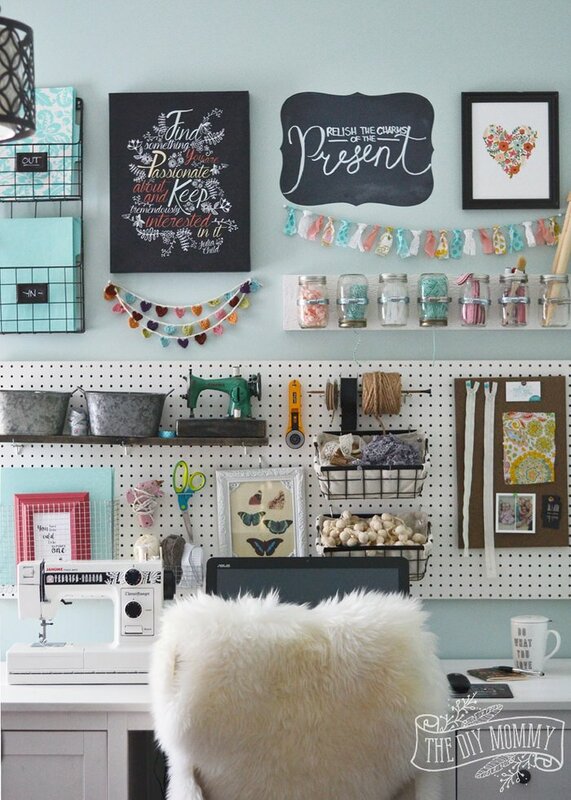 By the way, I want to create part of a craft room on one wall in my room. Any tips for creating a craft room for one wall? This was a sensational post. I was engaged and sauntered through your blog for hours. Thank you so much for posting fun relevant content….ohhhhh and these pictures are sublime! Well done and nicely curated! An inspiration for those of us just starting out!